Plants are the reasons we are living. Nature has offered so much to us. Nature is both benevolent and disastrous. Nature gave us life and most importantly she produces plants. Since time immemorial till now, plants are giving us everything we need to live. Some people love plants and they make sure they show their love by having plants. Some over-enthusiastic people who like to show off their love and hobby might maintain a fancy garden as well. Gardening requires people to store plants in pots or some kind of containers. This type of gardening can prove to be both good and bad for the plant. Now with having indoor plants, it can become really easy to tame the environment the plant is living in, but the watering habits can lead to the plant being either too moist or too brittle and dry. Lately, something really interesting got invented, and they are self-watering plants. Now the first question that comes to a human mind is what are these plants? Do they have hands of their own which they use to water themselves? Ha-ha well no. These plants are usually put in pots which have a pot perch where water is stored. Plats can stretch down their roots and have easy access to their water source and thereby get an adequate amount of nutrients. Not too much, not too less. Nutrient retainment: It is very common to see well-watered plants dying sooner than they actually should. A lot of people do not realize that the nutrients that the plant derives from the water may go out and potted plants need more than just that liquid to survive. Potted plants need external nutrients like organic matter. But the water perch under the pot will actually help the plant get proper nutrients as the supply is there always and in amounts the plant actually needs. Saving water and time: First coming to the time factor. Not all the people who love gardening or maintain a garden or even have a few plants can afford to sit around all day to check if his/her plant is getting enough water or not. Having self-watering planters can prove to be beneficial in this case. Saving of water? Well of course yes! A lot of water is wasted on the plants but still, they do not receive enough nutrients. Letting the plant choose how much it wants to consume can be better Thereby pot perches can even help in saving water. Healthier roots: Water is the only food that the plant needs apart from sunlight. Watering less can lead to very poor growth of roots in plants. Self-watering planters can scare away these phenomena. Self-watering plants have roots which reach out in the porch in search of water thereby getting stronger. Better roots produce better stems, leaves, and results in a healthy plant. These were few of the benefits of self-watering planters. 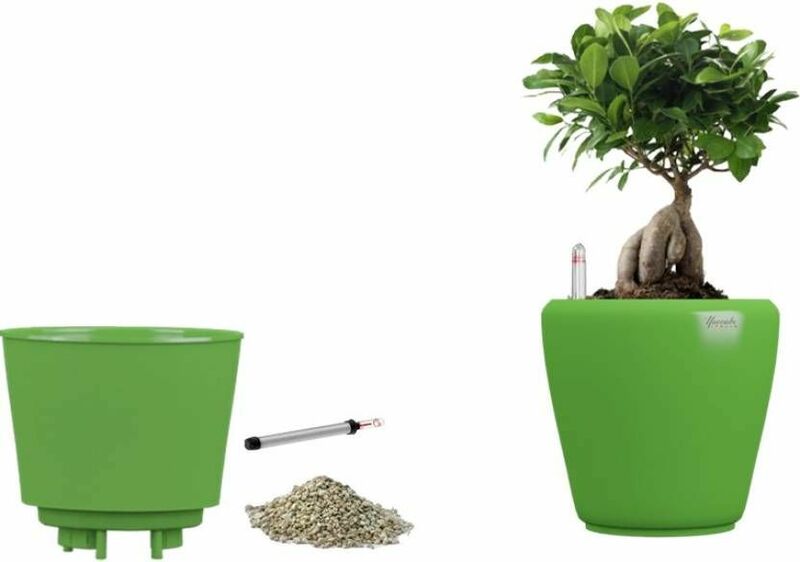 Now the question that might pop up is where to buy these planters, Buy self-watering planters online at Yuccabe Italia. We have a wide range of planters to choose from and we do not compromise on the quality.